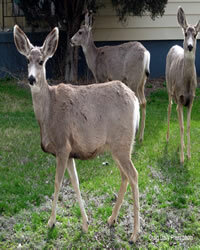 The Craig Chamber of Commerce receives a wide variety of questions about hunting in Northwest Colorado. Moffat County is the second-largest county in the state, is very sparsely populated and is mostly public land, including property managed by the Bureau of Land Management (BLM), numerous State Trust Lands, State Wildlife Areas, the Dinosaur National Monument and a portion of the Routt National Forest. 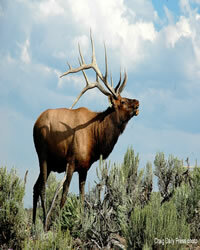 Deer and elk hunters typically pursue the migratory herds of these two species. We usually see deer and elk stay at the higher elevations above 8,000 ft or so, until the snow drives them to winter range at lower elevations to the west. Obviously, weather is the greatest influence on migration behavior and when the weather stays warm, the animals stay in the higher terrain. Antelope are prairie animals and like open country where they can put their extraordinary speed and excellent eyesight to use. The greatest numbers of them are in the sagebrush flats in the western part of the county, but they can be found in higher terrain if it’s open country. Where can I get wild game meat processed? Where can I sight in a rifle? 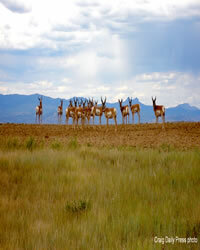 The Bears Ears Sportsman Club offers sight-in sessions prior to each combined rifle season. Also, their Cedar Mountain rifle range is open to the public the first Friday and Saturday of each month. For more info, call 970-824-2962. Can I carry a sidearm in the field? It is permissible to carry a sidearm (unconcealed) in the field in Colorado. Concealed-carry requires the appropriate permit. It should be noted that the state of Colorado doesn’t recognize concealed-carry permits from all states. It is the responsibility of the individual to determine if their out-of-state concealed-carry permit is recognized here in Colorado. Also, be advised that a law enforcement officer may require that a sidearm be surrendered during an official contact in the field. Can I carry a sidearm while bow-hunting? It is also permissible to carry a sidearm while hunting with a bow. It is illegal, however, to euthanize an animal with a firearm that has been wounded with a bow. Can I replace a lost hunter education card or hunting license? Replacement cards may be purchased ​from the CPW Licensing ​website for $5. The replacement will be a blue card printed on the same paper as a Colorado hunting/fishing license. Can I turn in a license and get a refund? You must relinquish your license and carcass tag before opening day of the season for which you have a license to obtain a refund. The license must be accompanied by a completed application which may be obtained from the DOW website or a DOW office. After opening day, refunds are limited to extreme medical circumstances of the licensee, death of the licensee, or death of a licensee’s immediate family member. More information is available in the 2009 DOW big game brochure. Snowmobile and ATV riders will find numerous opportunities to enjoy these popular sports in Northwest Colorado. Snowmobiles and OHVs may be registered at the Craig Chamber of Commerce. Resident and non-resident registrations are $30.25. Maps and other information are available at the chamber as well. Please note the Chamber also sells boat Registration.